As creative people, I would imagine that we don't do just one thing or have just one medium. I know that I certainly don't! Even though I create jewelry full-time, I am interested in lots of things, such as mixed media paper crafts, sewing, calligraphy, and fiber arts. Unfortunately, I find that I just don't have time to do it all, but I'll always have time to dabble! 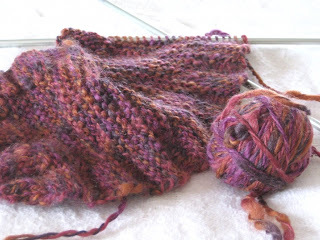 Right now, when I'm not making jewelry, I'm knitting scarves and getting ready for fall! Who knows.....maybe next week I'll be embroidering a card! What do you do on the side? I would love to know! Hooray for knitting! I've been knitting a lot too, which is outside of my usual medium of photography and collage. I've also been doing some sewing lately and loving that too!